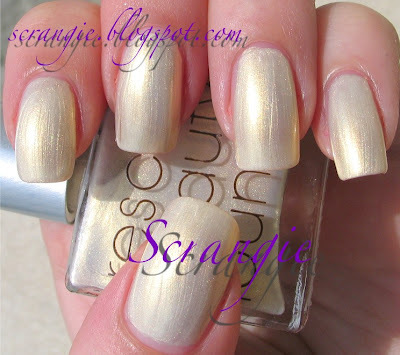 Scrangie: More Rescue Beauty Lounge Swatches! Here's just a little more eye-candy to get you drooling. I love these polishes to death. Ji (or anyone else at Rescue! ), if you're reading this, I need a purple! A bold eggplant, or deep shimmery violet! I'm begging, here! I'm dying for a rich, smooth, vibrant purple shade in Rescue Beauty Lounge's amazing, dreamy, buttery formula. Please? Pretty please? Pretty please with sugar on top?? Anyway, enough dreaming and begging and on to the pictures. Stormy. What a perfect polish. It really does look stormy! Grunge. Really odd and unique. I'm digging this. Under The Stars. Lovers of dark blues like OPI Yoga-ta Get This Blue or MAC Naughty Nautical will love this for sure. Deep midnight blue with the perfect amount of blue shimmer. And, this one's for Diann_co: Moxie! It's a pale white gold that looks absolutely luminous in the sunlight. Like CND Light Diffusion, but better! Grunge and Moxie are my two huge lemmings from RBL right now. : ( I just really wish it wasn't so expensive. is concrete jungle a tad blue irl? is the picture accurate...if so...I NEED IT! Laura, it does lean slightly blue, but not blue enough for it to not look grey. Wow, I don't make any sense LOL. Does that make sense? I'd say that picture is really accurate, maybe slightly lighter than real life because the picture is taken in direct sunlight. Ok, Scrangie.. Shut up already! If you continue to post RBL swatches so often I think I have to beg (or force, if begging doesn't work) for you actually buy some of them for me! Realized that amazon.com is the only other way to get it, and it'd be around 45 dollars for ONE polish. Makes me want to cry. But beautiful pictures, as always! But holy cow, $45 for ONE? Yikes! I can't believe Rescue doesn't ship internationally. You would think they wouldn't mine having a whole continent worth of new customers! Sanna, exactly :) It's very out of the ordinary and unexpected! Yum, polish fumes! That last one with the gold shimmer is to die for! I, myself, have never, not never, tried RBL. We don't have that fanciness here in Sweden! Rocketqueen, so I've heard! It's really a shame, I know there are a lot of people in Sweden who would love to wear Rescue Beauty Lounge! I would think having more customers would be a good thing... They should reconsider and ship internationally! Anyways, I've seen that you own ChG Recycle, is this one a close match to RBL Stormy? Thank you! Ana, it really is a shame! But I can definitely do a comparison picture for you if you would like! I would say it's pretty close to Stormy. Slightly lighter. It's similar enough to not need both. Thank you for the swatches! I really like Grunge and Stormy. I might have to give in and try them. I finally was able to get some EA's and their application is great. If these are as good as you say they are, I am going to love them! Asia12mb, they are like BUTTER. So smooth and perfect! I have only been able to get one EA (Ulta clearance bin had a ton of the same color) and it's really a shame they're discontinued! Look at that, you got your wish. Haha, I wonder if someone really was reading this post!